Get Ready to be a Spartan! You know I love obstacle and mud runs. But am I ready for the Reebok Spartan Race? Mmm, probably not. But it’s been added to my to-do in 2014 list! Not sure what a Spartan Race is all about? It’s about finding out just how far you can push yourself – and about smiling as you cross the finish line. Well, that’s my goal anyway. How about you, are you ready? If you’re in or around Tampa, Florida here’s a great way to test yourself if you aren’t sure or to help prepare yourself if you plan on running it. Doing anything this Saturday morning? How about doing a Reebok Spartan Workout with the #1 MMA Welterweight Contender Johny “Bigg Rigg” Hendricks? It’s free to the first 300 people to register! You can register here. I’m tempted to go just so that if they do it again I can see how much I can improve between now and then! If you ARE in Tampa, here’s another cool thing. February 15th we’re going to have “the most unique Spartan event” – the Special Ops Spartan Sprint Medal which includes a special finishers medal unique to this race! 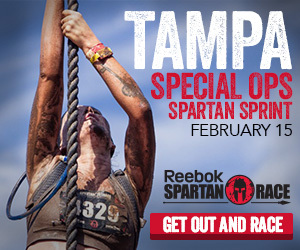 Whether you’re in Florida or not, here’s a chance to win your way into any 2014 Spartan Race in the continental US. The people at Reebok Spartan Race would like to give you a code for a free race entry or you can go here to get a code for 15% off a registration! If you aren’t sure if there is a race coming to your area you can check here. All you have to do to enter is leave me a comment letting me know if the Spartan Race will help motivate you to reach your goals for 2014. You get an additional entry for liking Spartan Race’s Facebook page and leaving me a comment letting me know that you did so below, I’d appreciate it if you’d leave them a message letting them know that Kinda Zennish sent you! A random winner will be chose Monday the 13th and announced here Tuesday. Good luck! This entry was posted in Discount Code, giveaway, Running and tagged mma, Spartan, workout by Kinda Zennish. Bookmark the permalink. I love Spartan races, good luck, I am sure you will ROCK it! I am doing the Spartan Race and would love to win another entry for a friend. I am Spartan ready… haha or maybe I am. Yes, the Spartan Race will definitely help me reach my goals. I’ve been hitting the gym more and preparing for a new year of races, including the Fenway Spartan hopefully. I like Spartan Race on Facebook. Spartan Race has already motivated me! Ran it in November and hope to do so again this year! I’m motivated to run a Spartan since I’ve never done it before. I’m trying to get in better shape so I can keep up with my boyfriend and all his running. This would totally help that.